Buckle up for 2 brand new missions, detail changes (as usual) and a fancy item for those who want to use respawns in a strategical way: welcome to an item the Community has been asking for…read on for all game update details. 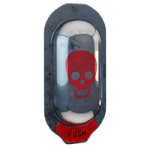 Artwork updates (Stims) – A batch of new 3D images has been added to update all stim items of the military class that have been extending the consumables recently. Mission – “The Lion’s Den” (level 11) is available at Hopkin’s Legacy which is part of the Barnard’s Star system. Mission – “Keeping the Peace” (level 10) is available at Barnard’s Star Jump Gate which is part of, (buckle up!) the Barnard’s Star system. Item – “Termination Pellet” has been added to the game, following a prominent Community suggestion. The “suicide pill” triggers respawning, and it’s offered by vendors at Caen Stronghold. Background Image (Freebooters) – The ration background image has been replaced with an optimized version. Express Shuttles (Departure & mobile) – The premium shuttles always depart instantly, therefore the “depart now” column has been removed which improves the mobile UI. This also resolved the issue on Caen Stronghold; you can now book a flight on mobile devices as intended. Syndicate Actions (Buttons) – Styles have been applied to several syndicate action links. Former text links like the increase of a syndicate’s member limit turned into buttons that they stand out.